A Letters Patent was issued on March 7, 1894 authorizing the construction of The Preston & Berlin Street Railway Company Limited, between the then Village of Preston and the Town of Berlin (renamed Kitchener in 1916). The object of the undertaking was to provide a direct means of transportation for the municipalities in the southerly portion of the County, including Galt, Preston, Hespeler and the intervening sections to and from Berlin, the county town, and at the same time to provide the towns of Berlin and Waterloo, as well as the surrounding district with a long-desired railway connection for passenger, freight and express traffic with the Canadian Pacific Railway at Galt. During the interval between 1894 and 1902, little if anything was actually accomplished towards the construction of the proposed railway. There were, however, numerous meetings and changes in directors. At a meeting in Preston on July 12th 1900, a proposal was submitted by President John Patterson, who was then connected with the Dominion Power and Transmission Company of Hamilton. He proposed the transfer of rights of the Preston & Berlin Street Railway Company to the Hamilton Radial Electric Railway Company. The proposal was read, then accepted after some discussion. During the following two years, surveys, plans and estimates of cost of constructing the railway were prepared, some right-of-way was purchased or optioned. At a meeting on June 3, 1902, the Directors of the Preston & Berlin Railway awarded a contract to A.A. McDonald & Co. for grading, ditching, culverts, fencing, track laying and ballasting. The work began immediately at the northwesterly end of the line on King Street at Albert Street, Berlin, proceeding easterly to the crossing point of the Grand River at Freeport. The work of construction then transferred to Preston and proceeded westerly to the Grand River crossing. With the arrival of rails, track laying commenced at the Preston end and continued to the bridge location at the Grand River and then from the westerly side of the Grand River on into Berlin. The bridge crossing the Grand River was constructed during the winter of 1903 and 1904. Following its completion the line was lightly ballasted. The electrification of the line was carried out by the Company during the summer of 1904. At the same time a steam power house was constructed at what is now Preston Junction. New boilers, together with other steam auxiliary equipment and a 350 h.p. engine were purchased from the Goldie-McCulloch Co., and from Canadian General Electric, a 300 k.w. generator and other auxiliary equipment. A car barn and repair shop were also built in the same neighbourhood. 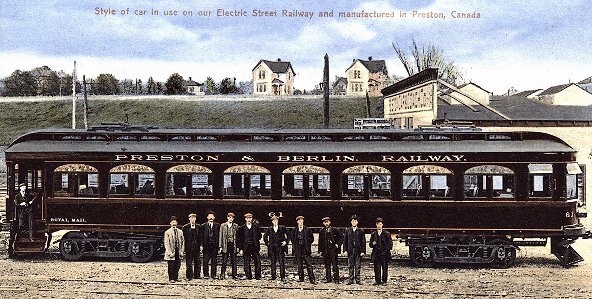 On March 17, 1903, an agreement was reached whereby the Hamilton Radial Electric Railway Company transferred its franchise and other rights to the Preston & Berlin Railway Company. Berlin & Waterloo Street Railway trackage from there through downtown to Water Street. This practice was discontinued in 1921 when the Grand River Railway put larger cars into service with the conversion from 600 to 1500 volt operation. The Grand River Railway constructed a new cut-off line from Kitchener Junction to Courtland Avenue where it rejoined the freight line. GRR passenger service was then moved onto the freight line, and cars could travel through to Waterloo. On August 18, 1903, a by-law was passed by the Town of Berlin authorizing the Preston and Berlin to extend its freight line from a point on King Street, across Cedar Grove Avenue and intervening private property in the south and west wards, to and along Wilmot, Turk, Park and Victoria Streets. This brought the railway line to a point beside Victoria Park where a freight shed and yard tracks were to be built. Freight service was not established until 1905, following the completion of what is now known as the freight line around Preston as well as the completion of the freight terminal at Linden Ave. and Joseph Street, Berlin. Then followed the completion of the line, Berlin to Waterloo. The track for a time terminated at the westerly end of Caroline Street near Erb Street, Waterloo, due to difficulty in getting around the corner from Caroline Street to and across Erb Street; a corner of a warehouse of Seagram Distillers, a three story building having to be removed, to provide sufficient space between the warehouse and the Grand Trunk track. When the rebuilding of the wall was completed and the scaffolding removed, the Grand Trunk lined their track over, occupying the land from which the corner of the building had been cleared, blocking the way. The late Joseph Seagram was not to be outdone in that regard and immediately ordered the tearing down of a further portion, and when that was completed he arranged for the Municipal Fire Department with two lines of hose to prevent further occupation on the part of the Grand Trunk. The hose was used freely on the Grand Trunk force, until the Electric Line track was laid in place, a matter of a few hours. This permitted the railway to reach their proposed freight terminal on Erb Street, Waterloo and really completed the construction work on the line for the time being. The Preston & Berlin Street Railway and the Galt, Preston & Hespeler Street Railway were amalgamated, effective January 1, 1908, under the name Berlin, Waterloo, Wellesley & Lake Huron Railway Company and leased to the Canadian Pacific Railway for 99 years. In 1914, the name was changed to the Grand River Railway Company Limited. February 15, 1997 Interested in Canadian Electric Railways?